Ricciardi & Ricciardi provides state of the art representation in criminal law and personal injury law to individuals of Worcester County. Founded in 1989, our attorneys reflect different strengths, which are combined in a team approach to litigation. Throughout the years we have guided generations of families through legal challenges. We have a long standing reputation of dedication to our clients and working hard to achieve the best results possible. Although our law firm is small in size, we make up for it in experience, dedication, personal attention and most importantly, results. We take an individualized, personal approach to all of our clients. That’s why our clients come back to us any time they encounter a legal challenge and that’s why they send their friends and family to us. We look forward to helping you with any legal issue you may have. 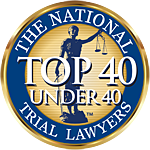 Areas of practice: Criminal Defense,Personal Injury, Real Estate, Estate Planning, and more.